July 31 is Flag Day in Hawaii. This holiday honors the flag of Hawaii, that officially symbolizes the islands as one of the U.S. State. Flag of Hawaii was designed in 1816 during the reign of King Kamehameha I and finally adopted in 1845. The flag consists of white red and blue stripes, that attribute to various historical flags of the United Kingdom. And at the same time stripes remind of American flag. A smaller depiction of the flag of the United Kingdom in the left upper corner reminds about the tight relations of Hawaii with this country. 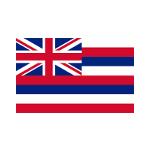 Hawaiian flag was changed several times until its final adoption. The alternation of colors and number of stripes subjected to changes. Originally there were either seven or nine horizontal stripes, but eight stripes were adopted in 1845 to represent all eight major islands of the state. Flag Day (Ka Hae Hawaii Day) was proclaimed by Governor of Hawaii John D. Waihee III on July 31 in 1990. Since then the holiday was celebrated annually.